Full of history and wonder, Ouro Preto is a jewel of Brazil that offers an experience a world away from the bikini-clad beaches of Rio de Janeiro or the bustling frenzy of Sao Paulo. Most notably, the small town has managed to retain its 17th century colonial architecture and old-world charm with barely a hint of development (save for a few well-planned renovations). Ouro Preto’s 23 churches and unique baroque architecture are a symbol of the prosperity that abounded during the old colonial mining town's gold rush days, and works from the highly-regarded Brazilian artist Aleijadinho can be found all over town. But to fully experience the wonder of Ouro Preto, a visit should be carefully planned—each church has a separate admission and opening hours. Here are a few places, along with times and ticket prices, to help you plan the ultimate visit to Ouro Preto. You can't miss it. The large open area is the main square of this charming town and is a great place to start your Ouro Preto journey. It is surrounded by some of the city's most impressive churches and museums. It's also free and open anytime, although evenings here are particularly special! You'll find this historical building on the south side of Tiradentes Plaza. The Museu boasts the old municipal headquarters and jail. It also contains the tomb of Tiradentes, one of the leaders of the failed uprising against the Portuguese colonization in 1789 known as the Inconfinencia Minera. History buffs will be pleased to discover documents of the Inconfidencia Minera, torture instruments, and important works by the area’s most notable artists and architects. Admission is R$8 for adults and R$4 for children. The museum is closed on Mondays, but you can check it out from noon to 5:30 p.m. on Tuesday through Sunday. This is possibly the busiest street in Ouro Preto as it is one of the few roads that can properly support cars. You'll find plenty of souvenir shops, dining and drinking opportunities along Bobadela. Just follow the road down from Tiradentes Square and see where they lead you. It's open all day and is free to stroll, although you'll be tempted to pick up some souvenirs or jewelry along the way. Ouro Preto's most opulent church, and the second most in all of Brazil (Salvador's Sao Francisco comes in first), is the Nossa Senhora do Pilar. Decorating the church is 424kg of gold and silver—but luckily it won’t cost you nearly that much to get in. 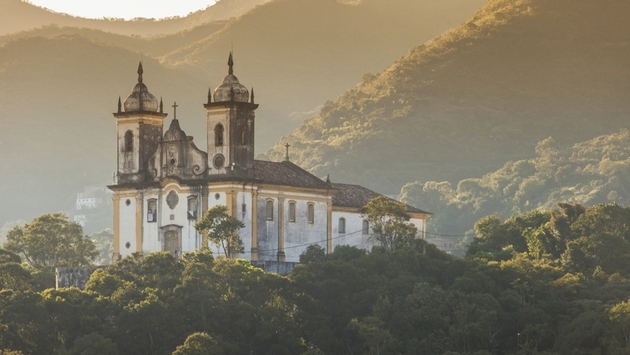 The fee is R$8 to get in on Tuesday through Sunday from 9 a.m. to 10:45 a.m.
One of Brazil's most exquisite churches and considered to be one of Aleijadinho's masterpieces, Sao Francisco de Assis is a must-see in Ouro Preto. The entire exterior was carved by the man himself, including everything from the cannon waterspouts to the Franciscan two-bar cross. It took Sao Francisco de Assis three years alone just to make the baptismal font in the sacristy. Admission is R$6 and can be visited from Tuesday to Sunday from 8:30 a.m. to noon and from 1:30 p.m. to 5 p.m. A ticket here will also get you into the Aleijadinho Museum. The Casa dos Contos is an old 18th century treasury building which doubled as a prison. It now displays the history of gold and money in Brazil. It also has a fantastic view looking out to the surrounding town. Open 10 a.m. to 6 p.m. Tuesday to Saturday and Monday 2 p.m. to 6 p.m. Admission is free. The Church of Our Lady of Mount Carmel was built between 1766 and 1772. It features a fantastic façade and two altars which were designed by Aleijadinho. Admission is R$2 and is open from 8:30 a.m. to 11:30 a.m. and 1 p.m. to 5 p.m. on Monday through Saturday. Sundays are open from10 a.m. to 3 p.m. This museum hosts an impressive display of religious art right next to the church of Our Lady of Mount Carmel. Keep an eye out for the collection of hand-carved miniature home altars and portable devotional shrines that date all the way back to the 17th century. The museum is R$4 to get in and is open every day from 9:30 a.m. to 5:30 p.m.
Ingreja de Santa Efigenia dos Pretos boasts a stunning location on a hilltop overlooking Ouro Preto. The image on the outside of the church is another work of Aleijadinho's. The history of the church is particularly interesting as it is rumored that the construction of the church was financed by the gold that accumulated in a fountain where the miners washed out their hair after a hard day’s work. The church is open from Tuesday to Sunday from 8:30 a.m. to 4:30 p.m. The Church of Immaculate Conception, built in 1727, is famous for its lavishly decorated altars. Aleijadinho's final resting place is in the cemetery here and the sacristy has a museum dedicated to him. You’ll find it open Tuesday to Saturday from 8:30 a.m. to noon and again from 1:30 p.m. to 5:30 p.m. It’s also open on Sundays from noon to 5:00 p.m. The admission is R$8. You’ll need a bit of time to dive in and explore all that Ouro Preto has to offer, but you certainly won’t be disappointed when you do! 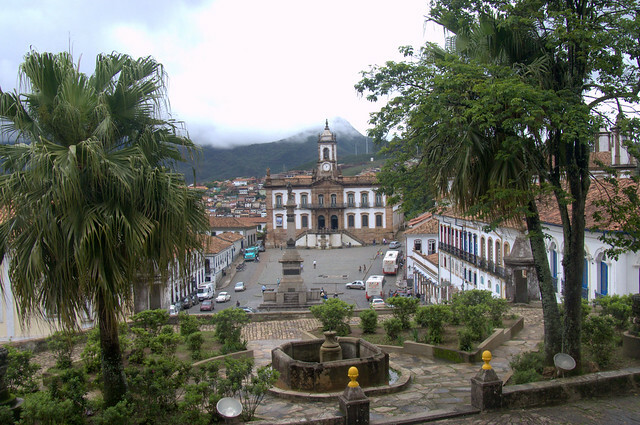 Have you visited Ouro Preto before? What did you think?